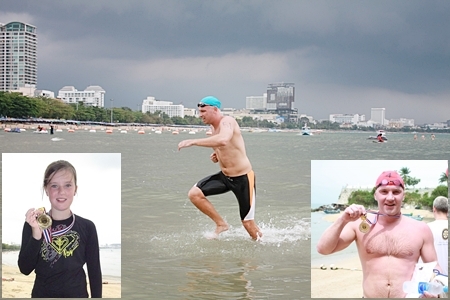 Nic Wilson (main photo) races home under stormy skies, wining the 3.5 km swim across Pattaya Bay. 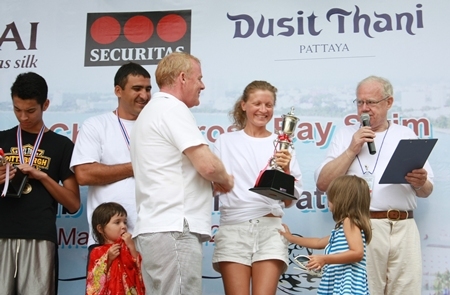 10-year-old Erika Heltne (left) won the short fun swim, whilst Aleksei Balykov (right) won the 1.3 km intermediate swim. The true winners, however, are the children as proceeds from the event will go to ensure clean water, education and a chance for a better future for those less fortunate in our community. 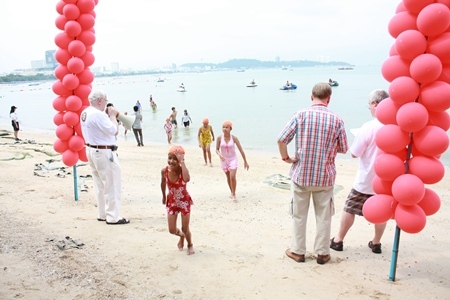 So with only a few weeks in the planning, the club along with the swimmers gathered at the Hard Rock Hotel Pattaya for the official opening ceremony. 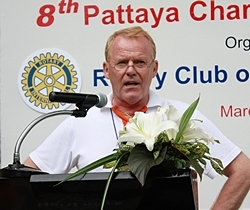 The club’s president, Gudmund Eiksund officially opened the event with a short speech, followed by Past District Governor Peter Malhotra and Radchada Chomjinda, director of the Human Help Network Foundation Thailand. 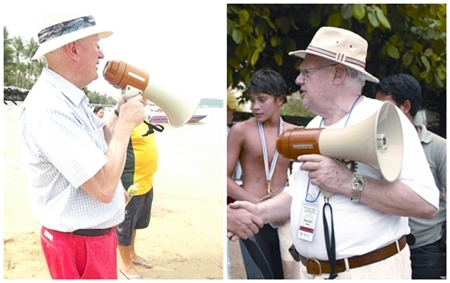 President Gudmund Eiksund makes his report to the swimmers and guests, before declaring the commencement of Rotary Charity Cross Bay Swim 2012. Philip Wall Morris and PP Brendan Kelly, without whom the event would not have been possible. 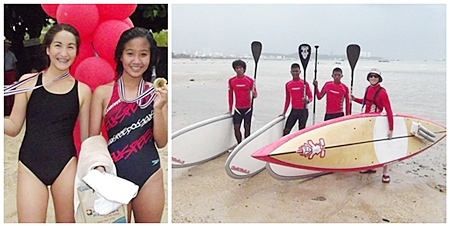 Rachada Chomjinda is thrilled that ‘her children’ were able to participate in the charity swim. A 38-year-old Russian man named Aleksei Balykov came in first with a winning time of 18 minutes and forty seconds, and just under two minutes later was 14-year-old Liam Samuels, closely followed by 37-year-old Mark Lunev. The first female was Mark’s wife, Natalia, with a time of just 20 minutes and fifty seconds. This didn’t deter the twenty or so swimmers who set off with much gusto, and back at the beach at the Dusit all the spectators were keeping a keen eye on the sea rescue teams who were traveling along beside the swimmers. 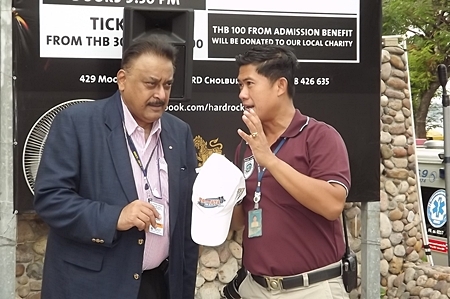 PDG Peter Malhotra and Pol.Lt.Col. 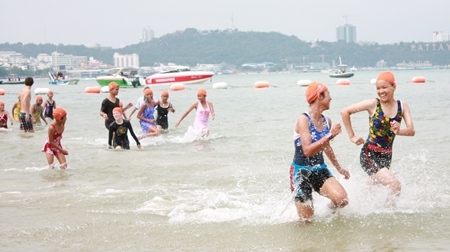 Jirawat Sukonthasap, Head of the City Hall Security & Safety Services, discuss the precautionary measures taken to ensure the safety of swimmers and guests both on and off shore. 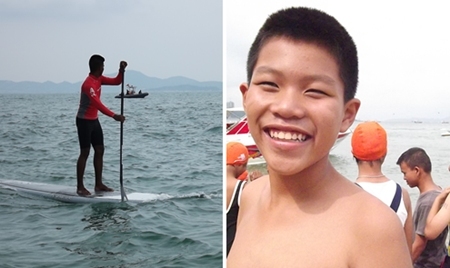 Nic is a swimming coach at Pattana International School in Bangkok and it was one of his students, 15-year-old Luc Gebbie who came in second, a mere 50 seconds behind his tutor. 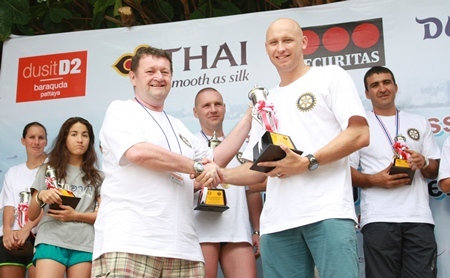 Graham Hunt-Crowley presents the Men’s Champion Trophy (3.5 km) to Nic Wilson. 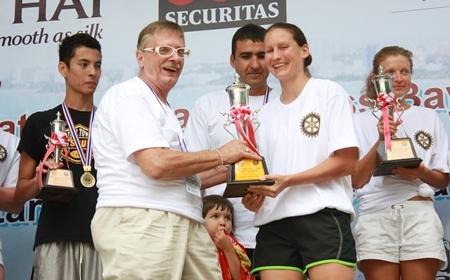 Hannah Way, the Women’s Champion (3.5 km) receives her trophy from Martin Brands. Paulaner was one of the many sponsors for the event. 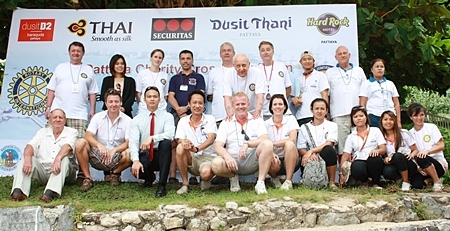 Others included Thai Airways International, Securitas, Pattaya Mail, Dusit Thani Pattaya, Dusit d2 Baraquda, Hard Rock Hotel, CEA Projects Norwegian Properties Group, The Tulip Group and Bangkok Hospital Pattaya. Natalia Lunev was first in the 1.3 km event. 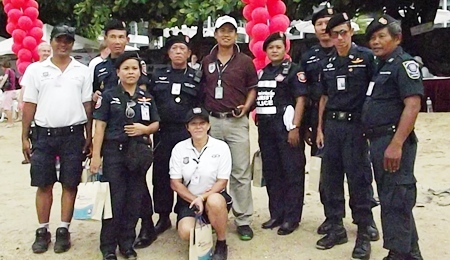 The event was also given the full support of City Hall, Pattaya Sea Rescue Unit, Sawang Boriboon Thamasathan Foundation and the Pattaya Tourist Volunteers. 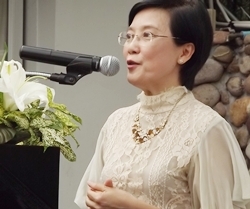 Then it was the matter of the prize giving where the trophies were awarded and thanks given to all the sponsors and those who had helped make this a special day, one that raises funds to support the clean drinking water and many other humanitarian projects across the province. (l-r) Aleksei Balykov, Liam Samuels and Mark Lunev are winners in men’s division of the 1.3 km race. 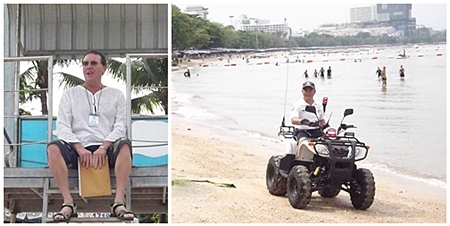 Well done Rotary Club of Jomtien-Pattaya! 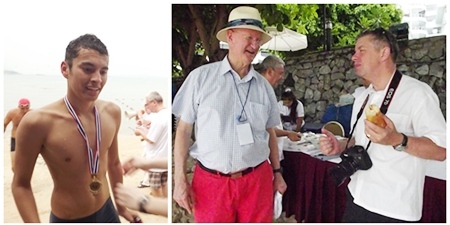 A special mention must be made of Brendan Kelly and Phillip Wall Morris, the dynamic duo who worked with the same focus to create fun events that people of all ages can participate in and raise money for charity at the same time. Proudly holding their trophies are (l-r) Mark Lunev, Natalia Lunev, Hannah Way, Kristina Solheim, Liam Samuels, Aleksei Balykov, Adounis Cedolin, Nic Wilson, Alena Vigada, Nook Buranasiri and Luc Gebbie, with Ken Whitty (far right) our generous sponsor ‘Paulaner’. Congratulations are in order for President Gudmund Eiksund (front centre) and his team of hard working volunteers including Rotarians, family, friends and staff that helped make the charity event a huge success. 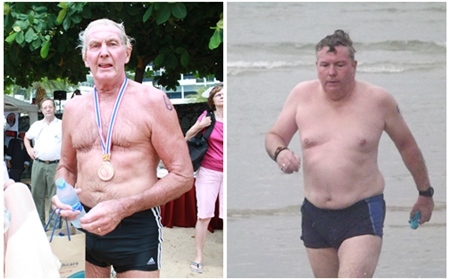 There was heart pounding action during all the 3 swim events. 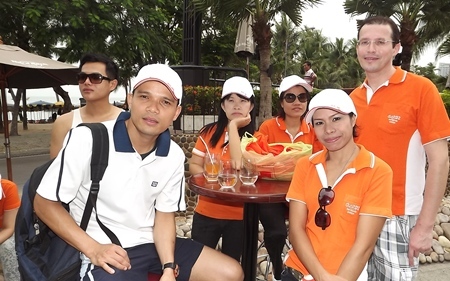 The beaches of the Hard Rock and the Dusit Thani Pattaya were buzzing with activity throughout the day. 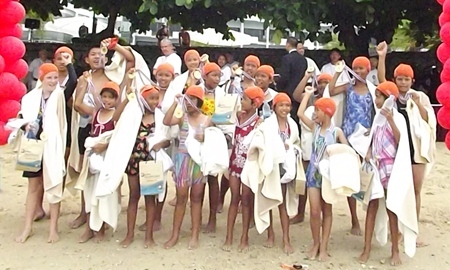 Swimmers young and older were cheered on to the finish line where they received their medals, a dry towel and a cold drink.